Guess where I'm sketching #1? I think I'm going to start posting some photos of places where I have sat and sketched and see if people can work out where they are. To be followed by sketch done while sat in said place. 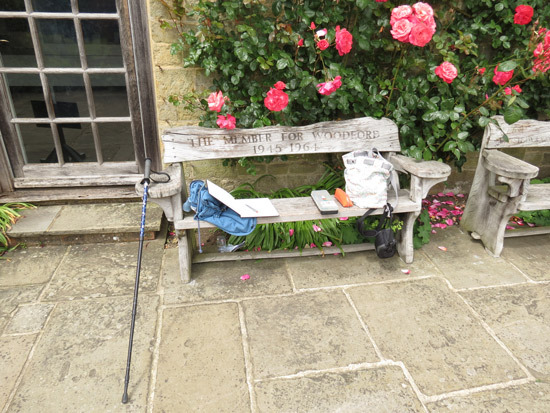 The bench was very comfortable, had a good view and had the added advantage of giving me somewhere flat within easy reach on which to put my Pencil Art Bin, pencil cases, rest my camera, leave my bag etc. Lying on the bench is my new Stillman and Birn Zeta sketchbook with extra heavy weight paper in Natural White (kindly supplied for review by Stillman and Birn via Jacksons Art Materials). I have to say I am liking it more and more with each use. It likes pencil, it's likes pen and ink a lot and it's absolutely fine for use with coloured pencils. Plus it lies absolutely flat when opened up - I really could not work with any sketchbook that didn't. A slideshow of the sketch I was doing will follow in the next post. While going through my sketchbooks for the book, I came across a sketch in a very old sketchbook that I'd never posted before. 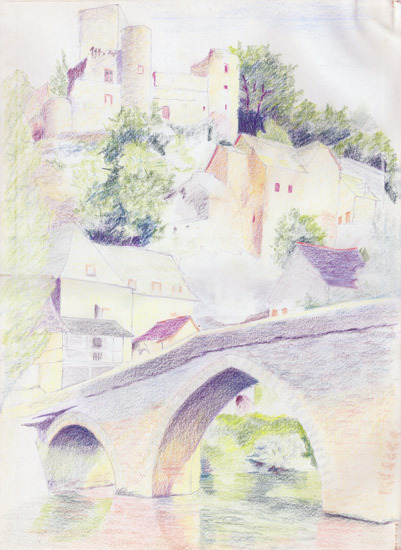 This is a sketch of Belcastel in the Aveyron done 20 years ago in July 1994. I'm looking up at the Château de Belcastel from the banks of the River L'Aveyron right next to the bridge over the river (here on the map). It's one of my favourite parts of France. This has 'status' in terms of me still being in the very early stages of using coloured pencils. I remember I used mainly pastels on that trip which involved staying in a very nice house in Cougousse. One of the interesting things about sketches is the way they take you back. I vividly remember drawing the angles of the houses and roofs of the houses very carefully. Plus being intrigued about how to capture the light under the bridge and its reflection in the river. I think I'll mentally file this away as a 'need to think about working up' folder. 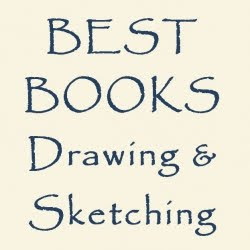 Maybe I need to post some more of my old sketches from 20 years ago? 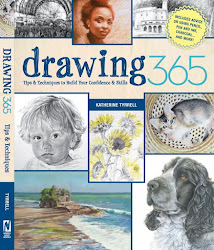 ..and finally - we have a video of me sketching! Watch it here - or for the big HD version click the link and go to YouTube where you can view it on my YouTube Channel. Below you can also view some photographs from my day out at Great Dixter yesterday. Making a video of me sketching! I've long said I'm going to produce a video of me sketching - and years have gone by during which time I have bought tripods etc and never ever done anything about it. We then come to the advent of the mini iPad and I've again begun to think about videos of sketching. Yesterday quite spontaneously I finally did it! ...and finally - this is it! This comes with about 15 seconds of thought and preparation and starts with me taking the mini iPad back into my own hands from "he who must not be bored while I sketch" - who was supposed to be filming me - just as he has yet another hay fever attack. That's when I discovered I could actually hold the iPad Mini and sketch by looking at the sketchbook through my iPad! For those of you with iPad Minis why don't you try it? You might be interested in how I hold a pencil....... however my pudgy hands distress me - they come courtesy of both age and disability! Other than that take a look at my first go at iPad videos of me sketching. 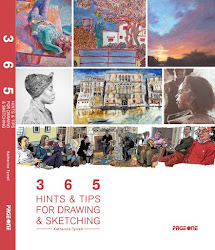 Like I said - this is spontaneous - and you get the usual features associated with sketching (something falls over , the sketchbook goes skew whiff etc). 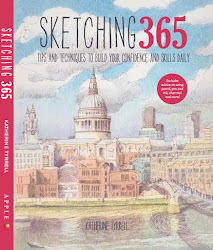 Who would have thought that writing a book about drawing and sketching would have led to a drought in terms of plein air sketching - and blogging about my sketching? My visual capacity in my brain has been completed filled with selecting and gathering in images (and copyright forms), rescanning and photographing over 100 images of my own plus creating lots of diagrams to explain points. 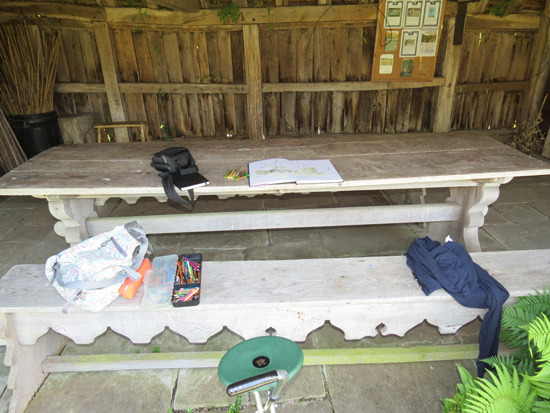 It was absolutely idyllic yesterday to sit in a very English Garden and enjoy the humming of the mower, the singing of the birds and the shade of a barn on a very hot day in East Sussex - and to also enjoy getting back into my plein air sketching! 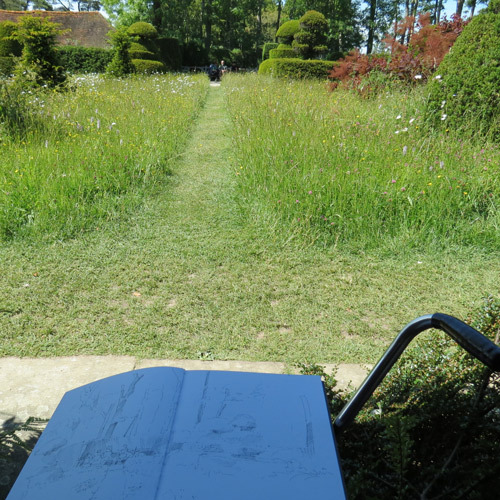 Here's the view of The Topiary Lawn at Great Dixter with its edge/fence of ash trees that I was sketching. The trees reminded me of both Sisley (long slim tree trunks) Hockney (tree surgery!). 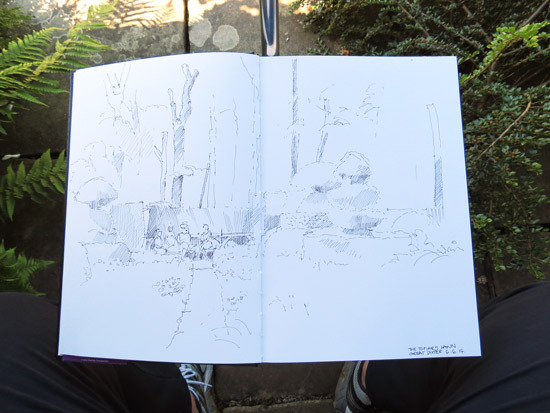 I liked the people on the big bench as it added life into the garden - and of course show me yew topiary and I'm itching to get my sketchbook out - all those nice big shapes! This shows you how far away I was actually sat - in the old cow shed which was lovely and cool (it was a very hot day yesterday!) 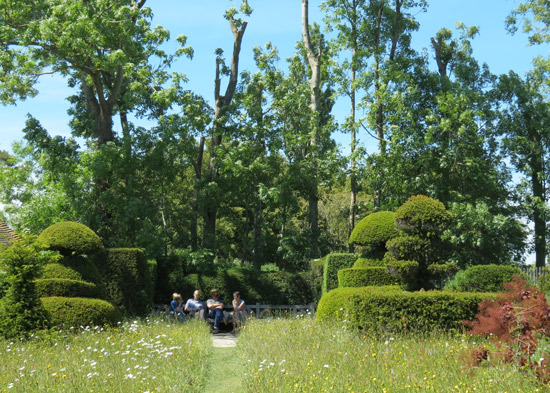 - looking out across the wild flower meadow which surrounds the yew topiary! Listening to the grass paths being mown. This is the pen and ink sketch - after a bit of judicious work in Photoshop - the photograph shows the white paper as actually being blue - as per the one above. particularly when it's a time of day when the sun is moving quite fast. This is where I'd got to prior to the video. One of the aims of the day was a test of my new Stillman and Birn Zeta sketchbook with extra heavy weight paper in Natural White (kindly supplied for review by Stillman and Birn via Jacksons Art Materials). Plus a new pen - a Sakura Micron Pigment Ink - size 01 with archival ink. More about this on Making A Mark Reviews later. Faber Castell Polychromos and there's even an old Karisma Lime Green in there! 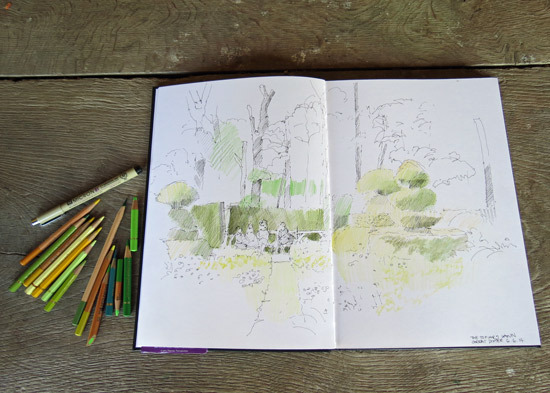 More of my sketches at Great Dixter can be found by clicking this link. This is what the wildflower meadows are looking like at Great Dixter at the moment. I have never ever seen so many orchids in one place! 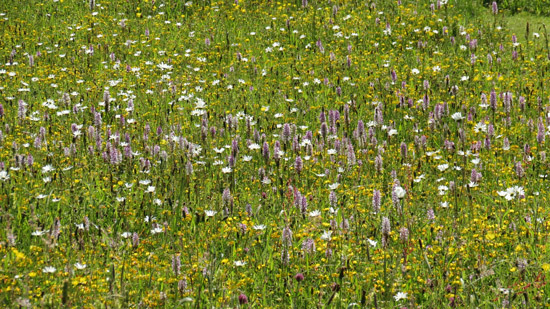 The meadows are part of The Weald Meadows Initiative developed by the Wild Meadows Partnership. 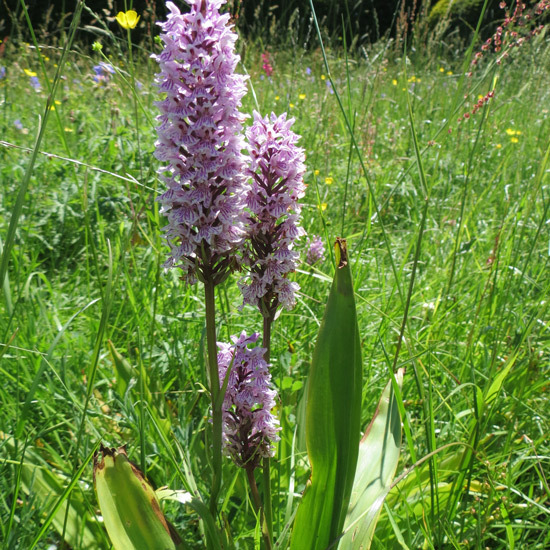 Great Dixter is supporting the High Weald Landscape Trust's campaign to double the number of wildflower rich grasslands in the High Weald by 2015. Now is the time to see them! in the Great Dixter Wildflower Meadows.